When you look at the ratio of the sale price to the list price for all single family homes combined, you get a average of 105.1%. So does that mean that all Ballard Seattle real estate is selling for 5% above list price. No, that's just the average. Some homes will sell for more than 5% above the asking price and some homes will actually sell for less than the list price. For all 3 price ranges, the majority of homes sold for above list price: 43, 55 and 53% respectively. 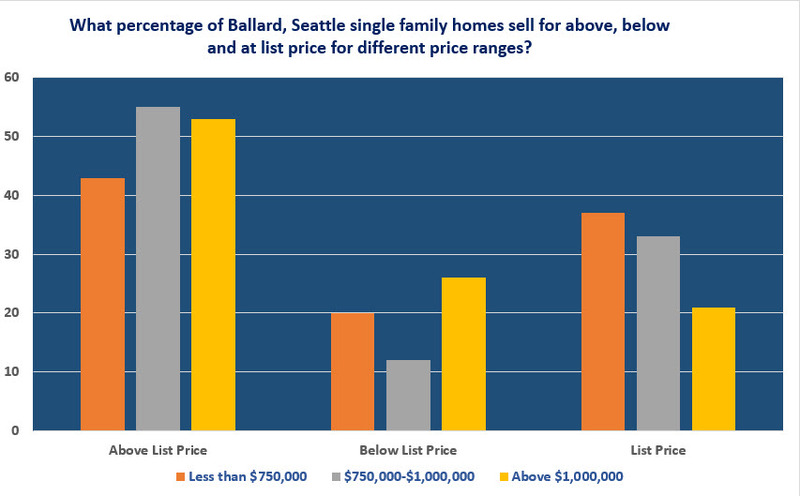 However, this means that between 45 and 57% of Ballard single family homes sold for either list price or less. This is a sizable chunk of the market and (relatively) good news for buyers. So no, not even in the hot Ballard Seattle WA real estate market, is every home selling "way above asking with multiple offer". Far from it. What about Ballard Seattle condos? Because of the low number of condo sales over the past 3 months, I did not calculate the percentages for condos that sold for above, below and at list price. The table below just lists the number of sales for each category. In the 3 months period for this data, there were a total of 30 Ballard condo sales. For both prices ranges, as with single family homes, the majority sold for above list price, with 7 of 13 condos listed below $500,000 and 11 of 17 units listed above $500,000 selling above list price. However, as with Ballard houses, not every condo is selling above list price and some are actually selling for less than the asking price. What does this meaN for Ballard home buyers and sellers? For the Ballard neighborhood Seattle, yes, we are firmly in a low-inventory, strong seller's market. However, just because the market is hot, does not mean you can list your home at any price and sell regardless with multiple offers. A significant percentage of single family homes sold for less than asking price. Don't get greedy and resist the temptation to push the price too high. Plus, you still have to make sure to prepare you home properly for sale if you hope to get the maximum return on your investment. Don't forget the 3 critical P's when selling your home! For buyers, yes, the market is competitive and for the best homes that come on the the market that are priced correctly, they are still likely to sell for above list price with multiple offers. However, a lot homes will still sell for the asking price or less. You need to be flexible in your wish list and know when to pick your battles. Be willing to walk away and maybe go after the lower lying fruit, as long as it's not a lemon! The above article "Percentage of Ballard Seattle Real Estate Selling Over List Price" was written by Conor MacEvilly. Conor is a Realtor living in the Ballard neighborhood of Seattle. He works with both home buyers and sellers in the greater Seattle real estate market and on and on the Eastside in neighborhoods like Redmond, Bellevue and Kirkland. Click here to conatct Conor with any qustions. I'm always happy to help answer any real estate questions you might have.